Most people experience frozen shoulder at the age of about 40–60. It is just like sprained pain in your shoulders. X-ray does not show any evidence of pains or what causes frozen shoulders at all. There are no scientific explanations for the cause by the doctors of the world. What happened? We have mentioned an article "What Does Makes You Sick?" At least you understand what's really making you sick of frozen shoulder. Your frozen shoulder may be due to accumulation of stress caused by malnutrition, pollutants from environmental atmosphere, etc. Yes, your frozen shoulder may be due to toxic matters from food and the atmosphere you live. Also see "Does Your Air-conditioned Room Make You Sick?" There are many factors that make you sick. It is very difficult to identify or point out the cause of illness you suffer, because many cases of maladies involve several intricate factors. For frozen shoulder, we tried the PYRO-ENERGEN treatment, and only 25–30% of patients were cured. It means that nearly 70% of frozen shoulder is not caused by the negative energy but other intricate causes. Our records of frozen shoulder treatment indicated that it heals faster when left untreated without doing any medical care. If treatments are applied such as massage, electric stimulation, and medical injection, its healing period will take as long as a month to a year. It might even worsen the conditions due to side effects. At first, it came to my mind that the cause of frozen shoulder is stress caused by some blockage along the nervous system related to malnutrition. I requested our friend doctors to apply more multivitamin supplements to the patients. Yes, the idea worked for about 20% of patients. That sounded good. Well, what about the rest of 50% patients? Before anything else, it is better for you to know the cause of stress. If you will see a comparison data among people in rural areas and people in industrialized cities, people in cities get more stress-related maladies. Where do these stresses originated? There are harmful fodders around us. There are various toxic chemicals used in the agricultural fields, too. Noise of automobiles, factories, air conditioners, and contaminated pollutants in the air, water and food. Contamination of bacteria, especially deterioration of human relations. All of these may cause stress in our modern world. When our body cannot resist against these toxic substances, then it will appear as stress or stress-related illness. It is almost impossible to change the environment you live. The only way to change is to resist against the environment you live. But how? I received strange messages from our sales representatives and clients, that a watch and music box makers in Switzerland can heal various illnesses. Yes, I believe in their claims, as I also noted it in the article "PYRO-ENERGEN Treatment and Listening Music: You Can Change Your Life to Success". Yes, this is true. To conclude and to get a definite answer for music therapy for frozen shoulder, our staffs and university researchers joined to test music boxes for its treatment. 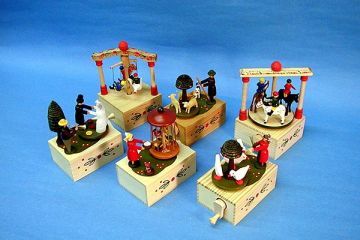 We applied music box therapy for the remaining 50% patients. We prepared a silent and air-conditioned room surrounded with thick green curtain. A big sofa was prepared, too. Patients lay down there with soft music sound from a music box. Twice a day and 15 minutes per session was applied. 30 out of 40 patients got well in a week time. That's a great improvement. We advised all frozen shoulder patients to have music box in their home for the treatment. Since then, three years had passed. The music box treatment is creating fantastic results for various maladies, not only for frozen shoulders but also for influenza, asthma, bronchitis, heart problems, hypertension, gastritis, stomach ulcer, constipation, diarrhea, Alzheimer's disease, Parkinson's disease, headache, migraine, nervous paralysis, diabetes, chronic fatigue syndrome, stress, gout, food allergies, atopy, eye problems, hearing problems and nose diseases including pollen allergies, and so on. We are extending music box treatment for pregnancy and for baby-expecting women for normal and healthy delivery of the baby, and also as a beauty care. The music box treatment is not a total cure but a simple remedy. 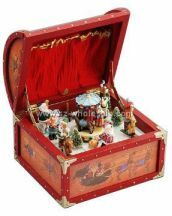 But if it can help you to get a relief from sufferings and pains, then there is nothing wrong listening to a beautiful sound of music box. In fact, there is a clinic, specializing in music box treatment in the Umeda Station, a railway station situated in the center of Osaka, and other several music box manufacturers specializing for the treatment of sicknesses in Japan and Switzerland as well as other countries. Foot detox is not clinically proven. See the articles "Does Detox Foot Spa Really Detoxify?" and "Domestic Syndromes and Detoxification Process in Modern Diseases". You can safely say that it is a business scam or business fraud. Now, can you believe that music box treatment mentioned here can detoxify? Is this true? Before listening tunes from music box, take a urine test and analyze its toxic elements. After listening tunes from music box, take a urine test again and analyze its toxic elements. The urine now contains more toxic elements. Does it mean that toxic matters are carried through muscle and nervous stimulation system, and discharged with urine? Let's enjoy listening beautiful music box tunes every day to relax and eradicate the stress in your body. Note: Our research groups reported that listening music requires one to two days of practice and concentration just like yoga.